COMMENTARY: God is the source of all that is spiritual and physical. God is the Law that governs all that is spiritual and physical. COMMENTARY: God is the Law that provides for and supports survival in this universe. The “personification” of God is simply poetic. It has been used to communicate the beauty of the abstract reality, which is God, in all its majesty. God is not physical or concrete. God is abstract. NOTE: Here “abstract” does not mean imaginary. The Law of Gravity is abstract but it is real. COMMENTARY: Any action of Man is judged by these eternal laws. A person faces the “Judgment Day” when, all of a sudden, he is faced with the truth that it is his own actions which are responsible for his condition. He can either take responsibility for his actions and survive; or ignore his responsibilities and succumb. Equivalent of this may apply to a society, a race, or even to whole mankind. and to You we appeal for help. COMMENTARY: It is this Law, and its Source, that we regard with utmost respect. It is That to which we go back again and again for help and understanding. nor of those who wander astray. COMMENTARY: May we perceive the right way according to these Laws, and recognize those who are following them; and not be deceived by those who have gone astray and are suffering as a result. “God’s wrath” is the unyielding nature of these Laws, which apply to everyone in the same manner, whether one is aware of them or not. One survives better when he follows the Law. One suffers when he ignores it. The image of a “Wise Old Man” who is angered at the impropriety of man has often been used for God. But this is no more than a poetic expression to convey the urgency of the message. Per Qur’an, God should not be substituted by any image. This also applies to any image for God formed in one’s mind. God is pure spirit – the pure essence of all creativity and intelligence, and the source of all life in its infinite variations. God is not bound by any finite personality. God is the source of all personalities. 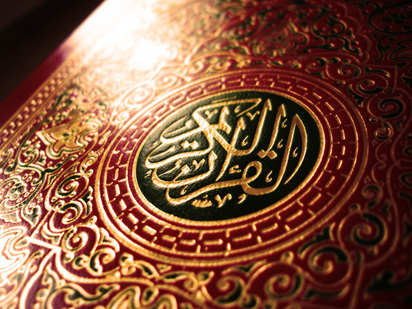 CAUTION: Please keep in mind that the Qur’an is a poetic rendition. It seems to give the impression that God is some Being, separate from one and external to one. But God is not an entity. God is formless. Any entity has to be defined in space. It is space that separates one thing from another. By separating things space gives form to those things. Form implies separation in space. Formlessness implies uniformity throughout the space. Therefore, something that doesn’t have any form has to be uniform throughout the space imbibing uniformly anything in that space. It won’t be separate from anything. In short, it would not be a separable or an identifiable entity. Islam considers God to be formless. Thus, God cannot be a separable or an identifiable entity. God has to be present uniformly in all things. Thus, God is that POTENTIAL OF CREATIVITY that resides at the core of any beingness. Note (April 2011): I wrote this essay many years ago. My expanded view on God is expressed in the essay THE NATURE OF GOD. 1. Well that is an interesting take on the divinity of Islam. 3. Why are you blogging about Islam? (1) Thank you for your comment. This is actually an essay that I wrote many years ago. I decided to put it under the category of religion on this blog. (2) When I originally wrote this essay, my looking hasn’t gone as deep as the unknowable. At that time I looked at God as a potential. (3) I am not blogging about Islam. I am blogging about knowledge. Knowledge comes in all different shapes and forms. You may ask the same question of Wikipedia.